It’s been a while since we held a giveaway over here and I wanted you to all have the chance to win some items perfect for the summer. Here I am with the first of a few giveaways – today, I bring you Hopes Relief. As families are embarking on their summer holidays, Hopes Relief products are ideal to take away, as they are suitable for the whole family – especially popular with mothers especially because of the natural ingredients and the fact that the whole range can be used on all ages. Hopes Relief are suitable for pregnant women, new-born babies, children and adults – in fact Hope’s Relief was originally created by a Naturopath for her own daughter. Hopes Relief is free from ingredients such as SLS, parabens, propylene glycol, lanolin, coal tar, artificial colours or fragrances, mineral oils and petrochemicals. 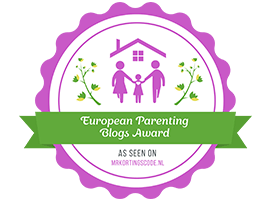 Hopes Relief is now a multi-award winning brand, Australia’s No1 natural eczema cream and renowned by mothers and trusted by families’ worldwide. With natural active ingredients including: Hospital Grade Organic Manuka Honey NPA 10+, Gotu Kola, Aloe Vera, Organic Calendula and Licorice Root to soothe and repair damaged skin, their pilot study shows that 93% of people show significant improvement. So what can you win from Hopes Relief today? 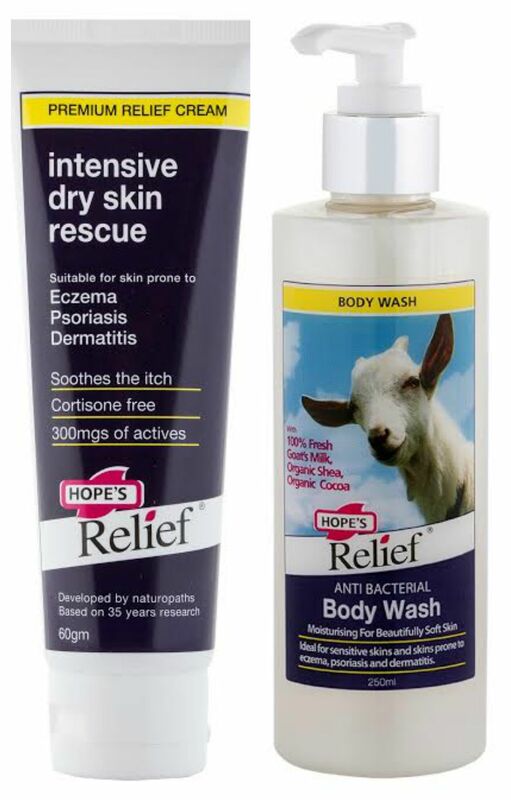 You have the chance of winning Hope’s Relief Intensive Dry Skin Rescue (Australia’s No1 natural eczema cream) and their Goats Milk Body wash (with 100% real goats milk). So what do you need to do? Just fill in the Rafflecopter below. This giveaway is UK only, all entries are moderated and verified. Giveaway ends at 11.59pm on the 31st of August. Good luck! A recent study found that 57% of children between 7-11 years old cannot swim. 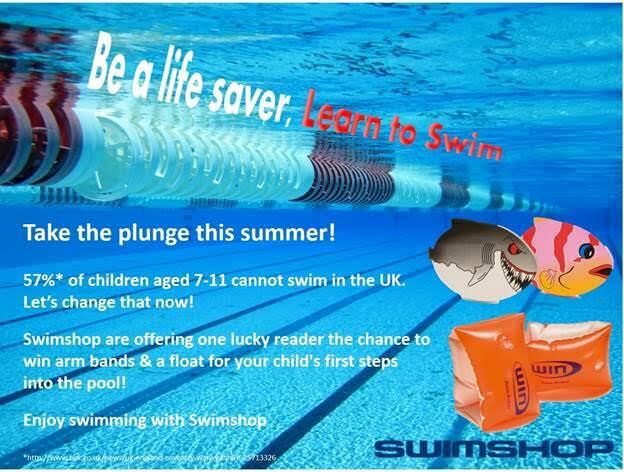 In a bid to change this we are running a ‘Save a Life, Learn to Swim’ campaign. Swimshop, known for their great swimming costumes, are kindly offering prizes to TWO lucky readers! As someone who herself can’t swim due to a traumatic incident when I was younger, I am keen for Jack to swim and not be afraid of the pool. We are also kindly being sent some arm bands and a float to aid him in his swimming journey. To make swimming seem even more fun and increase your child’s confidence in the water, Swimshop have collated some fun swimming games for free in the form of a PDF download that you can access here. If you would like the chance to win some armbands (as seen here) and your choice of float – Steve Sharky or Polly Fish, all you need to do is fill in the Rafflecopter form below. Giveaway is UK only, ending at 23.59pm on 30th June 2015. Is the man in your life looking to shape up? Perhaps KiqPlan’s Beer Belly Blaster is perfect for him! 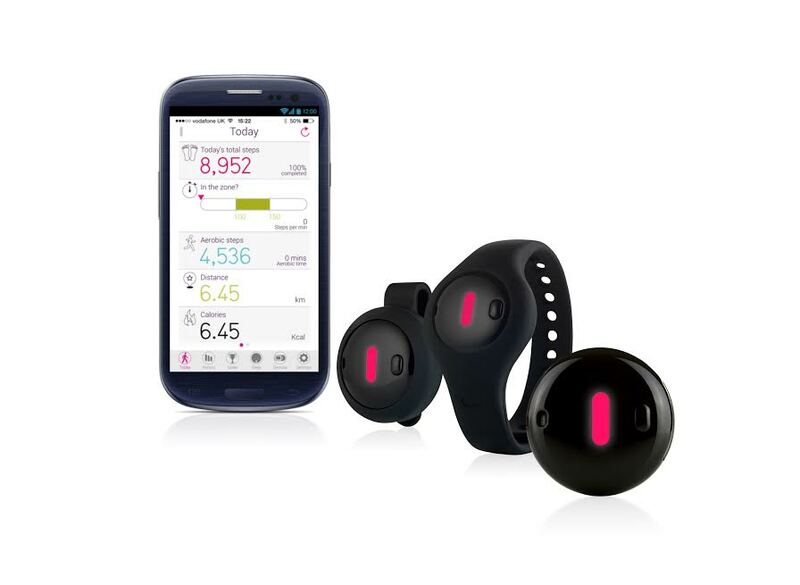 I am very pleased to announce that I am giving the app and a Fitbug Orb away to one lucky winner, in conjunction with Fitbug. 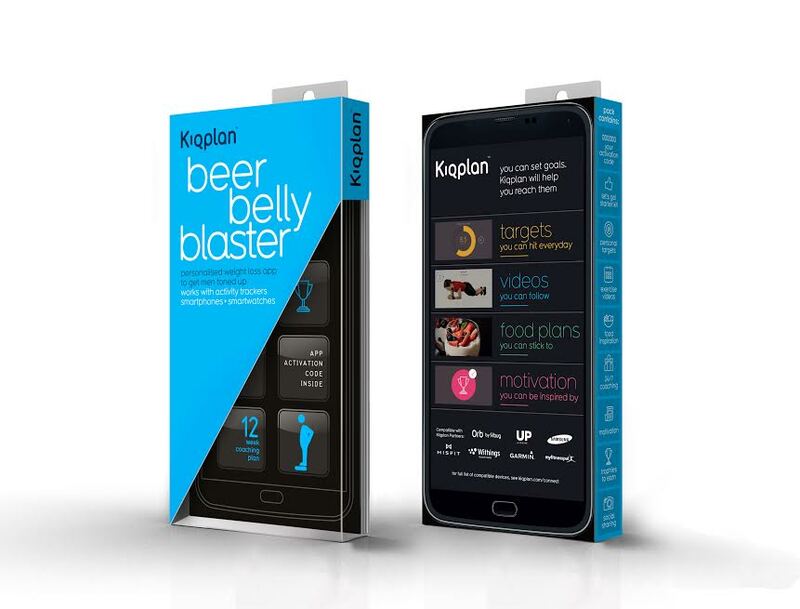 Kiqplan, the line of 12-week personalised training plans from Fitbug Ltd., have released Beer Belly Blaster, a fitness app tailored specifically for men who want to shape up and look their best. Created by personal trainers, dieticians and qualified fitness experts, Beer Belly Blaster is designed to work in tandem with most smart phones and leading fitness-trackers, including Fitbug, Jawbone, Fitbit, Misfit, Nike+, iHealth and more. 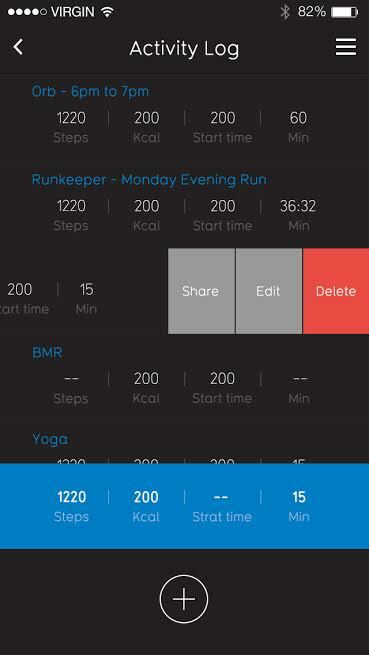 Kiqplan translates the data it receives from your device, and provides you with a personalised training plan, including “how-to” workout videos, nutritional advice, healthy recipes, sleep and step targets, plus much more. Beer Belly Blaster focuses on trimming and toning the belly and improving general fitness levels. The programme was created for men who haven’t exercised in a while and want to get back into shape. Split into 3 key phases, the programme starts with Total Body Strength workouts, designed to increase muscle mass and kick-start your metabolism. The second phase contains higher volume workouts, designed to increase muscle mass and therefore calorie burn while resting. This phase also includes core exercises designed to trim your waistline. The final phase contains higher intensity circuit-based workouts, designed to increase the calories burnt both during and after exercise and get the heart pumping. After including Sugru in last years gift guide, I am back again to recommend them. My Dad absolutely loved using his Sugru and has been telling everyone about it. To celebrate, I have a giveaway for one lucky winner to win a pack of the Classic Red and Mossy Green colours. Sugru is an awesome material described by many as play dough for adults, that sticks to almost anything and sets into a strong, flexible rubber overnight. If your dad’s motto is ‘waste not want not’, then Sugru will be the most exciting thing in his tool box since the cordless drill. He’ll be able to repair everything from worn out cables to car interiors, protect some of his most beloved gadgets and come up with his own creative DIY solutions ….. the possibilities are endless. Check out some more fabulous uses any dad can discover with Sugru here. Loved and used by dads in over 160 countries, Sugru is easy to use and a perfect gift for all handy dads out there with an eye for the latest technology. So what do you need to do to win? Just fill in the Rafflecopter below. UK only, ends 23.59pm on 30th of June 2015. Please read the terms and conditions. The fabulous team at Bluebeard’s Revenge have just released a new range of hair styling products – a pomade, matt clay and matt paste and one of you lucky readers has the opportunity to win some of the products! Let them tell you more.. It is said that the first thing a woman notices when she sees a man is his hair, and no man who takes pride in his appearance can afford to have a bad hair day. Thankfully, premium men’s grooming brand The Bluebeards Revenge has unveiled three brand new hair-styling products designed to tame the manliest of manes, adding a pomade, matt clay and matt paste to its already impressive grooming repertoire. 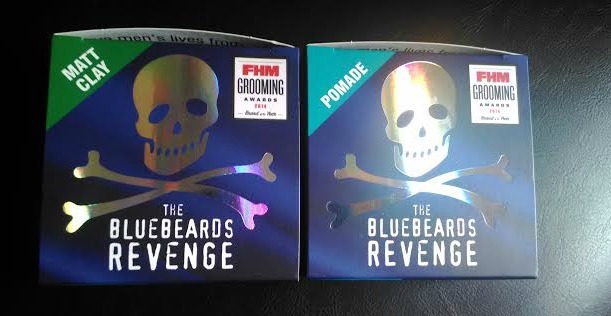 Dubbed ‘the world’s manliest grooming brand’, The Bluebeards Revenge is best known for its iconic wet shaving products, starting life as a shaving line aimed at men with tough stubble. It has since expanded to encompass all aspects of grooming, more recently beginning to focus on hair. Between them, the three new styling products have got every hair-related eventuality covered, with the pomade becoming a go-to for slicked back, high-shine styles and the matt paste suiting those preferring a rugged, textured look. For low maintenance styles, the matt clay provides invisible hold, creating an effortless look that appears natural yet defined. The products join a broad range of products already available from the iconic brand, including skincare and fragrance as well as a popular shampoo and conditioner. The styling products come just in time for those wishing to start the new year with a brand new, better-groomed version of themselves, and are available from The Shaving Shack, priced at £9.99. If you would like to enter, all you need to do is fill out the Rafflecopter form below. This giveaway is UK only and ends at 23.59pm on the 30th of June 2015.